The word "pharmacy" brings just one image to mind: shelves in a sterile white environment and boxes with strange names. This is the start of the story of Molecure Pharmacy, born of an idea by the latest member of a family that has managed pharmacies in Taiwan for three generations, and made reality by the experience of Waterfrom Design. The owner, born in the mid '80s, decided to completely subvert the traditional idea of a pharmacy, combining a modern environment with his style and quirks. The name Molecure is a combination of the word "Molecule" and "Cure", symbolising the first and most ancient aim of a pharmacy: to extract molecules from nature and synthesize them to create medicines. The design idea therefore recalls, on one hand, the primitive and natural side, which can be found in the wooden elements and hanging plants and, on the other, technology, through the presence of glass and metal. The two components meet in the large spiral staircase, symbolising DNA, connection and aggregation. 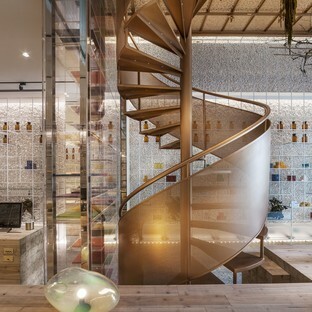 Nothing has been left to chance, and the user experience has been studied in every detail: from the entrance to the exit, the customer is accompanied through this space, which evokes a wide range of sensations, but certainly not that of being in a traditional pharmacy.